Ferndell (AKA Fern Dell) is a woodsy glen at the lower end of Western Canyon in Griffith Park. It is comprised of two sections. The lower section is a tropical garden with a variety of ferns, succulents, and other plants growing lushly along a man-made brook shaded by a canopy of trees. You stroll along a path lined with stone retaining walls and accented with rustic handrails, quaint footbridges, and conveniently placed benches. The upper section of Ferndell is primarily dusty picnic areas under a canopy sycamore, alder, oak, and redwood (yes, redwood). This section also has man-made streams that used to be fed with water from the observatory's cooling system and gurgled its way down the through the dell. But when the observatory was renovated, the cooling system was replaced and no longer releases its refreshing stream. So the stone-lined brooks through the picnic areas are dry. This hike described below takes you from the picnic area and within minutes has you climbing the dusty dirt road through the chaparral to the observatory. If you would like to add another 0.6 mile round trip to your hike, See Ferndell Gardens below. Your destination is the historic Griffith Observatory. It opened on May 14, 1935 and has become a venerable cultural, scientific, and architectural icon and one of Southern California's most popular attractions, In 2002 its doors were closed and a five-year, $93-million renovation secured its world-class standing as an amazing treasure. 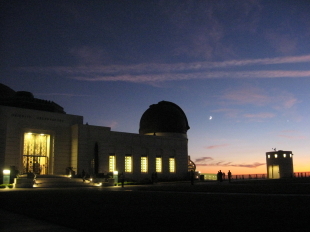 You can easily spend hours exploring the building, grounds, and astronomical exhibits, gazing through its public telescopes, viewing a live planetarium show, shopping in its gift store, or simply soaking in the breath-taking panorama of Los Angeles. And aside from its planetarium show, it's free! Mt. 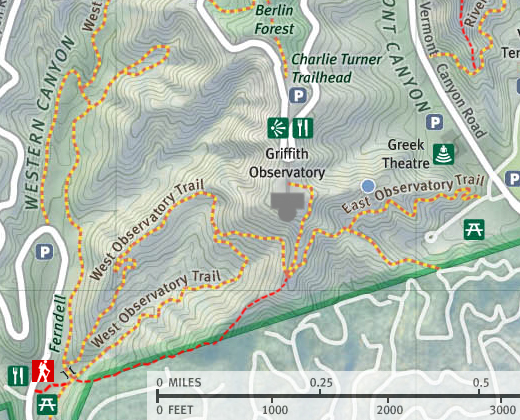 Hollywood extension: You can extend your hike by continue from Griffith Observatory to the top of 1,625-foot Mt. Hollywood to make an excellent 5.5 mile round trip hike. See Mt. Hollywood hike description. 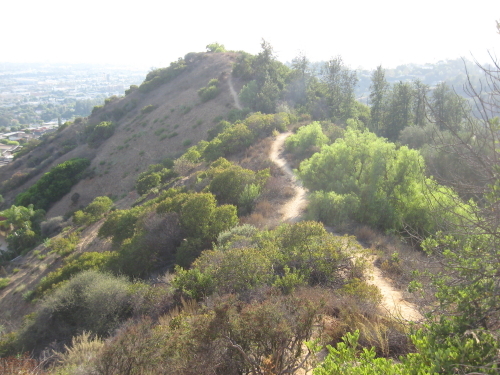 Even though trails in Griffith Park can be hiked year around, the most enjoyable time is winter through early spring when the hillsides are green, temperatures are moderate, and when rain has cleaned the air and/or when an offshore wind has blown all the murkiness out to sea. Spring offers an array of wildflowers while fall provides some color with the leaves changing. On hot summer days the baking sun can be punishing, so go early in the morning or late in the day. See Seasons of the San Gabriels for a detailed description of minding the seasons. From Los Feliz Blvd. (one block east of where Western Avenue terminates into Los Feliz), turn north onto Fern Dell Drive. See the hike description below for details from here. You can use the address of the Trails Cafe in your favorite online map program for specific directions: 2333 Fern Dell Drive, Los Angeles, CA 90068. NOTE: No parking/tow away along Fern Dell Drive and Western Canyon Road from sunset to sunrise. Some of the descriptions by popular authors are vague when describing the beginning of this hike, and so on my first attempt, I found myself wandering around confused and very uncertain if I was on the right trail. So below is my attempt to give greater specificity so that you may be able to confidently find the route. Paths through the Ferndell Picnic Area. Start of your hike. View Large Image. 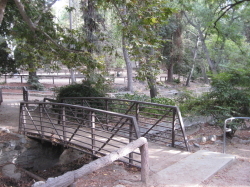 From the intersection of Los Feliz and Fern Dell Blvd, drive north on Fern Dell about 0.3 mile, cross a narrow bridge (immediately after the bridge, Red Oak Drive comes in from the left), Drive another 100 yards to an open street gate and notice Trails Cafe on the left and parking places long the road on the right. You can park along the street anywhere up to this point or after this point, but it's at this point that your route begins. Directly across from Trails Cafe, notice the opening in the fence. Pass through the opening and notice a pair of footbridges. The first bridge crosses the main creek that runs parallel to the road. 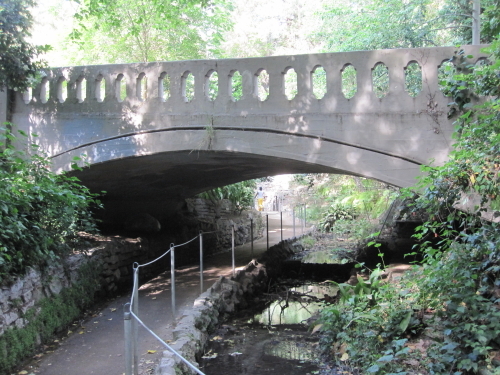 The second bridge crosses a tributary creek that comes in from the east and begins to parallel the main creek just below these two bridges. Cross the bridges to the east side of the creek and begin to veer left then follow the broad path as it begins to immediately curve right, heading east (this is where the path from Ferndell Gardens intersects coming from the south). You'll notice a restroom and some playground equipment a few hundred feet north of you (on your left as you walk east). Enjoy your canopy of sycamore, spruce, oak, and redwood; in minutes you'll leave the shade behind and will find that the rest of the route will be almost entirely in open sun (unless you are hiking in the early morning or late in the day where you will get shade from the some of the surrounding topography). In two or three minutes you will notice a footbridge on the left crossing the tributary creek. 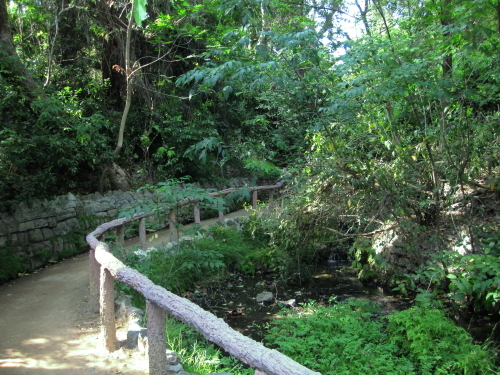 Crossing the bridge would take you on an alternate route that will rejoin the trail near the top. Also notice on the right a narrow trail heading up the slope; this use path steeply climbs the ridge to the five-point junction south of the observatory. But for this hike, continue straight on the dirt road. In another minute you begin to see the observatory perched on mountain in front of you. This is your destination. In a few more minutes the view north (left) opens up and you can see Mt. Lee with its famous Hollywood sign, and Mt. Hollywood due north of the observatory. Shortly, the trail bends north and in about 12 minutes from the start you reach a junction. Going straight takes the alternate route down from where you came up (you can go down this way on your return trip if would you would like). Turn right and follow the trail as it heads southeast. In another 5 minutes you reach a five-point junction. Looking south you are rewarded with a striking view of downtown Los Angeles, about 5 miles away as the crow flies. Looking north is a fine view of the grand observatory. View from south of the observatory from the five-point junction View Large Image. Follow the road north as it ascends to the eastern end of the observatory. 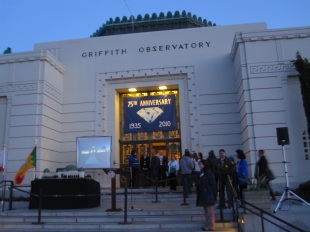 In 5 or 6 minutes (about 0.25 mile) you reach Griffith Observatory. Explore this historic landmark and savor its extraordinary views. Return the way you came and consider one of the two alternate routes mentioned above. If you plan on continuing to Mt. Hollywood, walk north from the observatory grounds past the parking lot and find the nicely landscaped Charlie Turner Trailhead for the Mt. 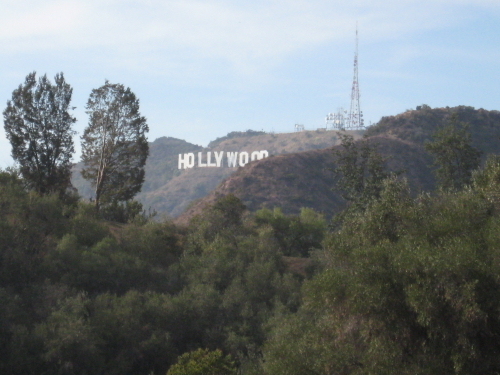 Hollywood Hiking Trail. The wide path is lined with trees and a rail fence. This is your route. See Mt. Hollywood hike description. Paths through the Ferndell garden paradice. View Large Image. The exotic gardens of Ferndell are officially called Ferndell Nature Museum, which can be kind of misleading if you are looking for a building. The "museum" is a walk through an exotic garden. There are no interpretive signs or any kind of printed guides available (that I know of) to help you know what's in this "museum," so just saunter along and enjoy the tranquil setting. 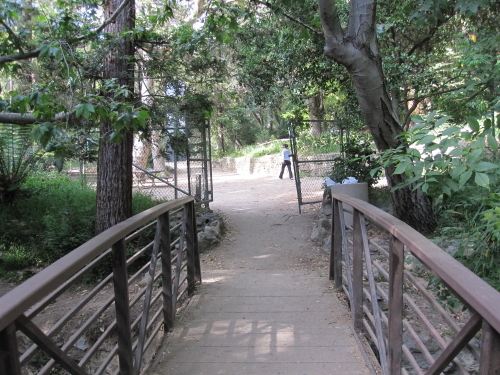 The Ferndell garden walk starts on the west side of Fern Dell Drive where Red Oak Drive intersects it from the west, about a 0.1 mile north of Los Feliz Blvd. A wooden sign "Ferndell" marks the stone-landscaped entrance. You pass through the gate and begin a saunter through a delightful oasis. You'll enjoy a variety of ferns, succulents, and other plants growing lushly along a man-made brook shaded by a canopy of trees. The park website states that there are more then 50 species of fern. You stroll along a path lined with stone retaining walls and accented with rustic handrails, quaint footbridges, and conveniently placed benches. About midway along your walk a bridge crosses over to a gate on the right providing excess to the street. At about a quarter mile from the start, the path bends right and crosses under Fern Dell Drive, and then in another minute the exotic garden culminates. Going left (west) through the gate takes you out to the street where Red Oak Drive intersects. Going straight (north) goes through a gate unto a wide path in Ferndell Picnic Area. 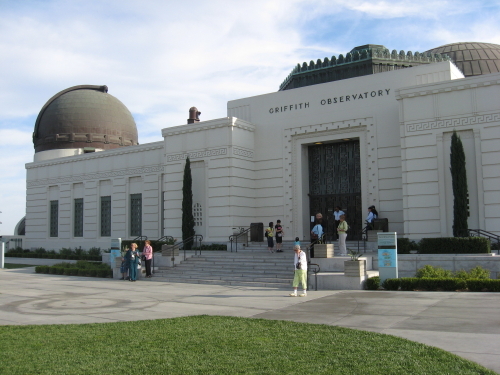 To continue to Griffith Observatory, walk another minute past a restroom on your right and follow the path that bends right (east), keeping the stream on your left. Join the main hike as described above. View Large Map / See also Griffith Park Maps page. Some years ago I hiked with LA City Councilman Tom LaBonge (the park is in his district and he hikes a lot in the park) who said he goes with the classic, old-school spelling of Ferndell as one word, because that's its historic use. I seem to remember, going back 40 years to my Boy Scout days, Ferndell was one word. I've also heard that Ferndell is run together as one word to help distinguish it from the Fern Canyon (most definitely two words) area of the park. LA Times style, during my long hiking columnist tenure there, was to use Ferndell as one word. For decades we hikers had to make do with Hileman's Recreation and Geological Map of Griffith Park. It labels the area Fern Dell and the (now removed) Ferndell Ranger Station. Bolstering the case for one word are geologists who long ago identified a fault in this area of the park, still known as the Ferndell Fault. On the excellent new Map & Guide of Griffith Park published by the city in late 2007, it's Ferndell as one word when described in the text as one of the Points of Interest. 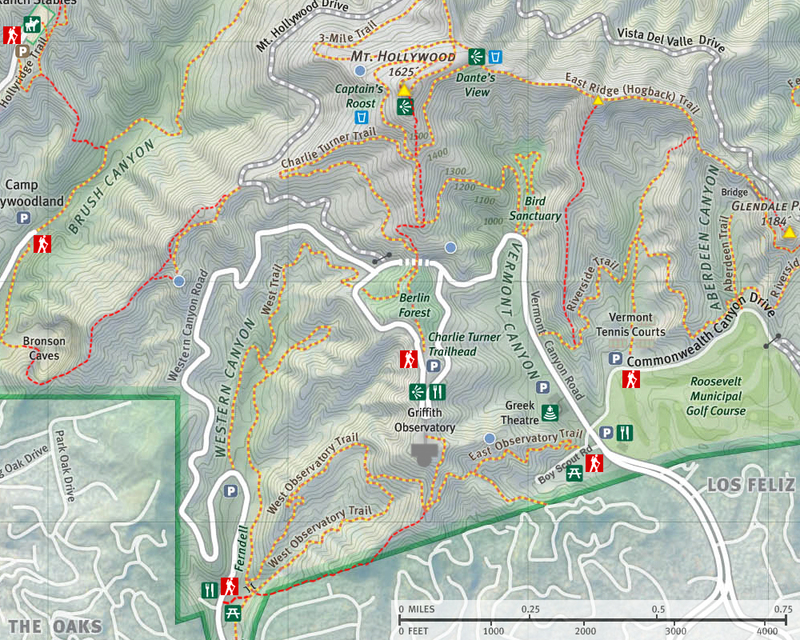 On the map itself, it's Fern Dell Drive (correctly) while the ferny sanctuary is labeled Ferndell Nature Area. Traditionalist that I am, I opt for Ferndell, but for what I think are a lot of good reasons! Los Angeles County: A Day Hiker's Guide - by John McKinney (The Trailmaster, 2006). "Ferndell." A nicely written description of this present hike from Ferndell to Griffith Observatory. McKinney's write-up is what first drew me to this hike. However, his description for the beginning of this hike is vague and had me wandering around confused. Day Hikes Around Los Angeles - by Robert Stone (Day Hikes Books: Red Lodge, 2003). 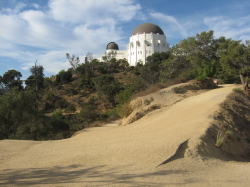 Hike 67: "Griffith Park Observatory to Ferndell Park." Describes this present hike, upside down, and includes the Ferndell gardens in the hike. Scant on some of the navigational details. Day Hikes in the Santa Monica Mountains - by Robert Stone (Day Hikes Books: Red Lodge, 2012). Hike 9: "Griffith Park Observatory to Ferndell Park." This is the same hike as he describes in his 2003 book (above), only with a few more details. He doesn't underscore that the hike is upside-down with the last half of the hike climbing 500 vertical feet to finish. He also incorrectly refers to "Griffith Park Observatory" when it is actually simply "Griffith Observatory." Afoot and Afield in Los Angeles County - by Jerry Schad (Wilderness Press: Berkley). Area B-6, Trip 1: "Fern Dell-Mt. Hollywood Loop." Hike description beginning at the north end of Ferndell Picnic Area heading north to Mt. Hollywood and returning to Ferndell via the observatory and West Observatory Trail. His hike does not include the Ferndale garden section. This page was last updated November 22, 2013.